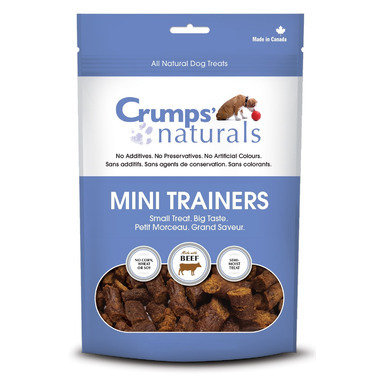 Crumps Naturals Mini Trainers Beef is a semi-moist treat and packed with flavour. They are perfect for training your newest best friend without all the calories! Chicken, Beef Liver, Molasses, Guar Gum, Brown Rice Flour, Rolled Oats, Flaxseed Meal, Paprika and Rosemary Extract. Great company, but this one item didn't agree well for my dog.